After Bihar and Gujarat, Bharatiya Janata Party’s operation to finish all opposition reached Uttar Pradesh when in a sudden development, two Samajwadi Party and one BSP MLCs resigned from their respective parties and did not lose time to praise the Bharatiya Janata Party. Another SP MLC, Madhukar Jetley, was also said to have resigned after meeting Shivpal Yadav. So far there is no confirmation from Jetley about his move as Shivpal was understood to have persuaded him to delay his departure. The resignations by Yashwant Singh, Bukkal Nawab (SP) and Thakur Jaiveer Singh coincided with BJP national president Amit Shah’s arrival in the state capital on Saturday on a three-day visit. Apparently the three are likely to join the BJP. The ruling party has only eight members in the Upper House while the SP has 66. With these resignations, SP’s strength in the Council will now be reduced to 63. Nawab, a Mulayam Singh Yadav loyalist, began extolling Prime Minister Narendra Modi and Chief Minister Yogi Adityanath saying that the two leaders were doing good work to implement sabka saath, sabka vikaas. He also said that he will support the move for building a Ram temple at Ram janmbhoomi. Founder president of Rashtriya Shia Samaj, Bukkal Nawab joined the SP in 1992. He contested Assembly elections twice, but lost. He was sent to Vidhan Parishad in 2012 and then again in 2016. Nawab and Yashwant Singh’s membership was to last till 2022. Yashwant Singh resigned and accused former Chief Minister Akhilesh Yadav of being “anti-national” for praising China at the Vidhan Parishad. “For me country comes first and Akhilesh has lowered the nation’s prestige,” he said. Besides Maurya, Chief Minister Yogi Adityanath, Deputy Chief Minister Dinesh Sharma, Transport Minister Swatantra Deo Singh and Minister of State for Science and Technology are required to become a member of either of the two Houses by 18 September. Earlier it was said that Adityanath and Maurya would respectively seek re-election from an Assembly constituency in Gorakhpur and Phulpur respectively. With the Opposition formulating a joint strategy to back Mayawati against Maurya, a new set of rumours began to swirl. It was said that to avoid embarrassment, Maurya would be inducted in the Union Cabinet where a reshuffle was now due. 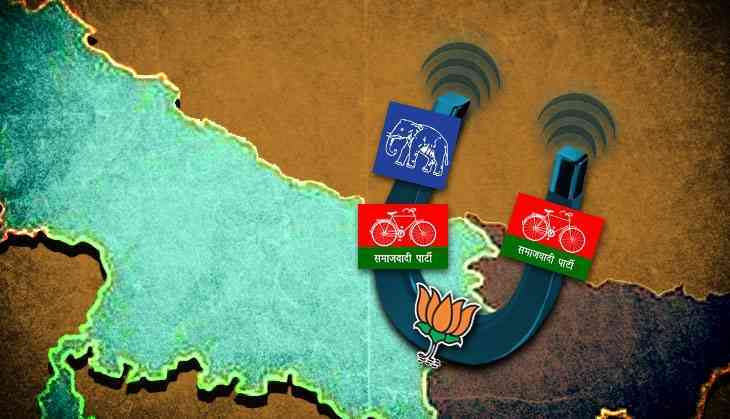 The SP and BSP MLCs vacating their seats for the BJP ministers gave a new twist to the rumours. Samajwadi Party president Akhilesh Yadav criticised the BJP for “luring” away his legislators. He said the BJP was scared of facing the electorate and was looking at safe options. “From Bihar to Gujarat people are watching BJP’s large-scale political dishonesty and they will give it a befitting reply,” Akhilesh said. Akhilesh was trying to mollify Nawab, who was upset with the infighting in the SP. “I had gone to Bukkal Nawab’s house on Eid and he must have resigned after being given some allurement. I have been trying to speak with him to find out why he was preventing the BJP leaders from facing the voters,” Akhilesh said. Shivpal used the opportunity to ask Akhilesh to hand over the post of party president back to Mulayam if he wanted to avoid more legislators from exiting the party. He later left for Delhi to meet Mulayam. However, Shivpal ruled out joining the BJP. Along with these MLCs there was talk that BSP leaders Ambika Chaudhary and Naseemuddin Siddiqui and some MLAs too could join the BJP. Chaudhary, a former SP minister is now with the BSP, denied that he was quitting the party. Siddiqui, who resigned from the BSP a few months back after leveling corruption charges against Mayawati, was reported to be in touch with the BJP.